Recently, Christi and I experienced a very sad loss. 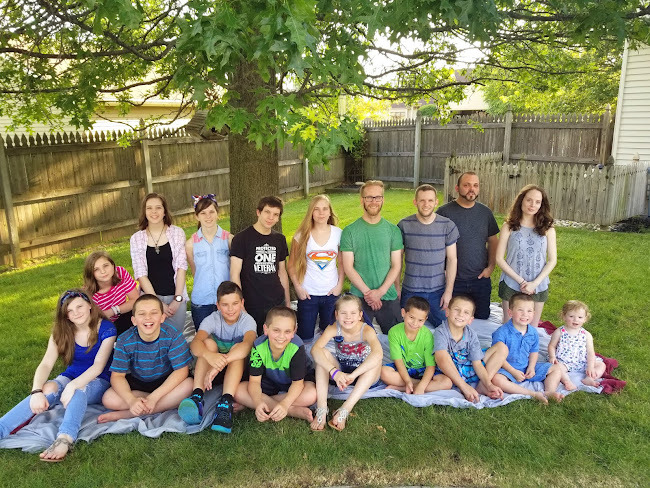 At approximately 8 weeks gestational age, it was confirmed what would have been our 17th child, had ceased to grow, and the placental sac appeared empty. We had held out some hope, because the initial blood tests showed Christi's HCG to be sufficient, but her progesterone was low, and to further muddy the waters, the ultrasound she had done was an external. At this early stage, an external can be virtually blind. Her Dr. prescribed progesterone supplements and had her take things easy, which she tried very hard to do, but if you know her, you know that easy for her is what most of us call busy. Notwithstanding, her spotting eventually began to be bright red and we went to the ER where the bloodwork showed a decrease in the HCG and a vaginal U/S also showed an empty sac. It was a very sad time for us, and it hit me much harder than I would have thought. Christi says she had a feeling that something might not have been right and the low progesterone may have helped ease her emotions just a bit. Still it was very hard. Some don't realize that for folks like us, even a relatively early loss like this is still the loss of a child. Her doctor offered a D & C procedure to ease the process and due to a risk of hemmorage, but she really preferred to allow for a natural passing of the tissue. In the next 24 hours however, she began to have very severe cramps and pass large amounts of bright red blood and tissue. Remembering the doctors concern about bleeding, we chose to go ahead with the procedure. Everything went very well, and one small plus was that he didn't have to dilate her as she was already in the process of miscarriage. She is healing very well physically and although she has put up a very brave face, she has felt the loss deeply. I saw it in her eyes when I took the kids to run errands, which I do from time to time to give her a quiet house, and she ran after me and made me leave Nathaniel to be with her. She immediately took him to the couch and cuddled him close. Yes, she grieves the loss of the baby that could have been, but she is healing and looking forward to trying again. Dr. Byrne has been really great and says that all should be well whenever her cycles kick back in. I am so sorry. I also had a similar experience and yes it IS heartbreaking! even at 8 weeks! my heart goes out to you. I am so sorry for your loss too. It's never easy to go through at any stage. Thinking of you both at this sad time. Set your DVRs! Or not.